I learned that children choose themselves where they want to work on an assignment. For example, a child chooses whether he / she wants to work / learn at a single table or at a 2-person table. During a learning period of about 1.5 hours, I saw more students changing places – shifting between work at a single table and work at a 2-person table. During the math assignment “36 + 28”, I observed that children used methods of their own choice. For example, one student used the method 36 + 30 – 2. Other students used other methods with which they felt more safe. During a reading task, I noticed that children read in books of their own choice. For example, one child read a Lucky Luke book, while another child was reading a Guinness world records book. A parent told me that her children find learning materials / education materials themselves on the Internet. For example, a parent explained that her children found learning materials on YouTube made by people, who live in Australia, and experienced that these learning materials helped them understand a particular topic well. From one teacher, I learned by observing how she does classroom management that changing between tasks helped children stay motivated. During one learning period, which had a duration of about 1.5 hours, the teacher changed relatively rapidly between work on math, geography as well as reading, speaking, writing, and singing in German and English. 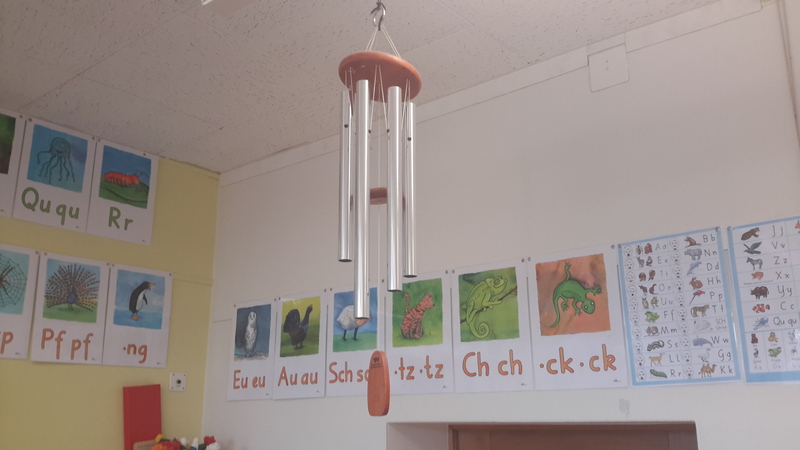 Observing how a teacher educates, I learned that mixing up work on various subjects with movement exercises such as walking through the room, stretching and clapping rhythms that the children repeated helped the children to concentrate. I noticed that ringing a bell helped a teacher to create silence and create awareness among students that a new task is coming up. From one teacher, I spoke with in the morning, I learned that she is – together with students – testing / trying out different kinds of learning environment design. For example, I noticed that there were both single tables, 2-person tables and 4-person tables in the room. Also, there was a free space in the middle of the room for everyone to come together. I learned that room dividers such as book shelves and things attached to and hanging down from the ceiling helped children to concentrate. I learned that questions asked both by teachers and students triggered some highly valuable discussions as well as reflections among everyone. For example, when a teacher asked the question “How is it possible that it can snow in St. Moritz and during the same period of time not snow in Zürich?”, there was significant thinking and discussion activity going on. This and other questions asked by the teacher as well as by students was, to me, a highlight of the learning sessions I participated at during during open school day. During an individual assignment, I noticed that when there was a problem / challenge / task, which children had difficulty finding a solution to, he or she asked questions to a teacher or to another student. It was wonderful to see how everyone wanted to help each other to learn. During more learning periods, I noticed that one teacher helped out coaching a couple of children who needed help, while the other teacher was helping other children in the same room. I learned that the coaching done by an assistant teacher helped everyone – including the person wanting coaching, the other children, the lead teacher as well as parents. In a highly interesting conversation with a very experienced teacher, the teacher explained she is learning that work using various social media / platforms / artificial intelligence is replacing craftsman work with physical materials such as knitting. For example, drawing tasks using AI tools such as this is more interesting for children, for example because they are given constant feedback from technologies. It surprised me that a relatively large amount of work / learning was done using paper, pencil and physical books – and that relatively little work / learning was done using Internet / tablet / smartphone / laptop and / or other technologies. I saw no children with smartphones / tablets or other mobile, electronic devices. There was no open wlan / wifi available. A grandmother, who was at open school day with her grandson, told me a story from when she was young. She explained to me that when she was young, practically all children had lunch with their families at home. Reflecting on that time, she realized that it was possible for example because families had home based businesses such as farms and/or because grandparents cooked lunch for the grandchildren.